Inflatable Ball Exercises - Fabrication Enterprises Retail Sales Corp. When you were a kid an inflatable ball was used for nothing but enjoyment and fun. Now, as an adult you can still use inflatable balls for fun, but you can also use them to workout. Exercise is a great way to stay healthy and active especially if you have been sitting at work all day. Below you will find various exercises you can practice with an inflatable ball. Overhead wall squats are a great way to work on your lower body as well as your arms. Overhead wall squats consist of a traditional squat while holding the stability ball with the arms extended overhead. Adding weight while keeping the torso in an upright position engages the shoulders and deltoid muscles. To begin, start with your legs shoulder width apart and your hands above your head holding the inflatable ball. Next, bend your knees and go as far down as you can go before coming back up to the starting position. Doing these squats 10 to 15 reps a day will help you work on your lower body strength. Although using an inflatable ball is not the same as lifting weights, you can still get a toned upper body with this following exercise. Balance pushups take regular pushups and move it to the next level with an added balance challenge. Start by lying face down on the ball with hands and feet touching the ground and the stomach on the top of the ball. Walk the hands out until the shins are resting on the ball and the torso is in a flat push-up position. Lower the torso towards the ground until the upper arms are parallel to the ground. Return to the push-up position and continue for 8 to 10 reps. The core is your most important body area to work on as it helps stabilize both the upper and lower body. To exercise your core, try practicing knee tucks. This exercise leaves you in a same position as balance push-ups, but you will be actively using your legs and core this time. To start, go into a push-up position with toes resting on the ball and arms straight, with hands on the ground under the shoulders. Bring your knees towards your chest until the knees are directly under the hips. 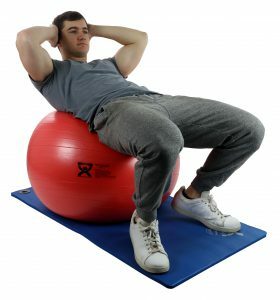 Extend knees back to a push-up position and repeat for 10 to 15 reps.
With an inflatable ball, you can work out your entire body and this tool is one of the few pieces of exercise equipment that can do that. Using an inflatable ball at home, at work, or at the gym is a great way to exercise and stay active. To view more exercises you can perform with an inflatable ball, click here.